In the New Testament narratives of the Crucifixion, you make only one appearance, one that is brief but meaningful: you were selected to help Jesus carry his cross. In Matthew’s Gospel (27:32), we read that “as they went out, they came upon a man of Cyrene, Simon by name; this man was compelled to carry his cross.” And in Luke’s Gospel (23:26), you were “seized” when you were coming in from the country. Whether you were “compelled” or “seized” does not matter; it was you, of all the people present that day, who became the one who helped the Son of God. You were one of many people there on that day, that Good Friday, to be a witness to the death of a good man who happened to be the Savior of the world, only no one knew it at the time. Perhaps you realized that after your encounter with Jesus on his last journey and walked with him, literally, on his last mile. We don’t know why you were there; perhaps out of curiosity you went to see for yourself—what and who—Jesus of Nazareth was all about, like many other people who were present that day. Were you one of the “secret followers” of Jesus who remained hidden until the last moment when, by your actions, you came forward to assist him? Scripture says you were “compelled” and yet, people since that time have continued to believe that you volunteered out of pity and mercy for a good man who was facing his death alone. We are not precisely sure why you were there, but you were, and you were plucked from obscurity by the Roman soldier to come forward to carry Jesus’ cross with him. You were Jesus’ last helper. You are depicted in many ways and in many forms of media, through paintings, sketchings, sculptures, even in mosaics. Sometimes, you are presented as rough-hewn and scowling, not a little put-out by having to perform this duty, when others could have done it, and you could have been left alone; at other times, you are presented tenderly, with a countenance that bespeaks of mercy, pity and compassion, and you willingly offer your hand and your heart to Jesus, who, divine as he was, gratefully accepted the very human help you offered him. Carrying a cross is a difficult thing. Early on in his ministry, Jesus beckoned everyone to “pick up your cross” if they wished to follow him. Many at the time did; and today, many do, and yet there are others still who either don’t or won’t, for it is too much. The cross is a burden and far from being a light yoke, but Jesus underwent the burden of carrying it. It required fortitude and patience and in many cases, not a small amount of suffering and a great deal of love—yet Jesus took it up. Jesus entered Holy Week with palms and hosannas in the highest and ended it being treated worse than a criminal, being crucified between criminals, with the prospect of burial among criminals. And among the sufferings he had to endure were those of betrayal and denial, to the point that the only ones left at the foot of the cross were his mother, the dedicated women who believed in him, and the beloved disciple, John. The connected and the powerful of his day disdained him and his message; his own people (and not a few of his disciples) hoped he would be a Messiah and the rescuer of Israel. Everyone, from Pilate on down, had him pegged wrong and only saw him in ways they only wanted to see him, not as he was. Because they were human, they could only see surface realities; the Romans and the Jews of the day could only think about what truly mattered: their rank and position in the world. For them, there was no other reality. It took Jesus being crucified on the cross to prove them wrong. Once you and Jesus—and the cross you both carried—reached Calvary, you “disappeared.” You had done your duty in what was perhaps the very first act of Christian charity: you performed an act of mercy when you helped Jesus carry the cross. 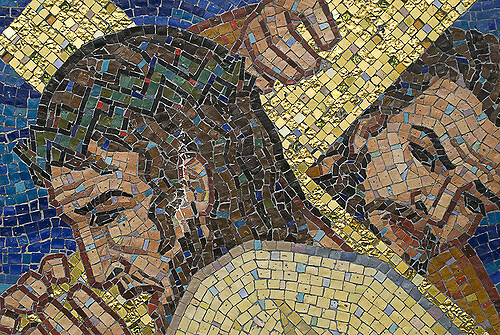 Simon of Cyrene, you are a figure of curiosity—what happened to you afterwards? Did you leave Calvary hill a changed man? Were your eyes opened by Jesus? Was your life given a new sense of purpose by what happened? Or were you like the others, who felt sorry for a good man who was overwhelmed by the powers that be who could not possibly have been the Messiah, but simply a man who preached justice and mercy but was given none? I prefer to believe the presentation of you as a man of tender countenance who willingly offered your hand and your heart to Jesus, with mercy, pity and compassion. The picture of you that has survived through the millennia is a needed one, especially in these days, when hatred, intolerance and violence are the rampant diseases of people who wish to overwhelm everyone with their sense of rank and power, expressing in the evilest way possible their never-satiated need of entitlement and dominance, in defiance not only of their fellow man, but of God. Simon of Cyrene, you took it upon yourself to help a suffering Jesus. You didn’t have to, but you did. You are the model that the world needs today. In carrying that cross with Jesus, you became like him; help us to become like you, so we can become like him whom you helped that day and that in so doing, we can be the servants he wanted us to be and show the world yet again that there is another way.